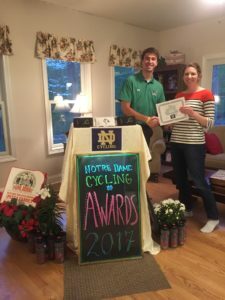 With cycling’s finest descending to Dusseldorf for the Grand Depart of the 2017 Tour de France in just a week, it is time to enter the Notre Dame Cycling Fantasy Tour de France League! Entry is simple. 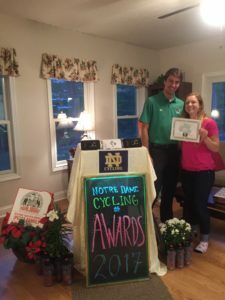 Create a (free) Velogames account, build your team of 9 riders, and then enter the ND Cycling League code to join our league. 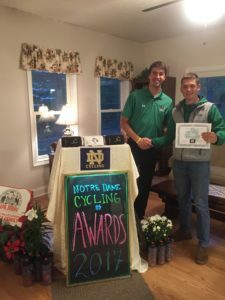 Donate Now for to vote for the Cycling Club on ND DAY! 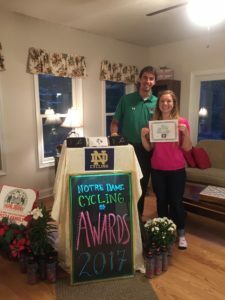 Notre Dame Day is this weekend! This marks one of the best opportunities for us to raise money through donations. Help us reach our financial goals to offset the costs of next year’s club travel, equipment, and competitions. 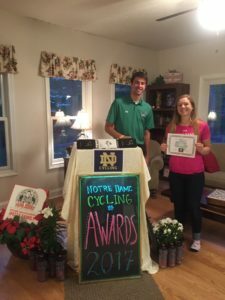 With ND Day fast approaching, it’s time to sprint to the finish line! 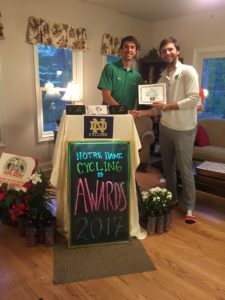 Through giving donations and casting votes, donors can help the cycling club to acquire a share of the $1,000,000.00 ND Day fund pool. The more votes we receive, the more money we acquire. 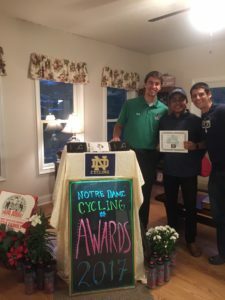 It’s like ND Day makes the money you give to the cycling club multiply! That is pretty awesome! For the first $10 donation, you may cast 5 votes for any club, and for any additional $10 donations, you may cast one vote. We ask that you cast whatever votes you have for our club. This will help us defer the cost of transportation, uniforms, and racing expenses for next academic year. 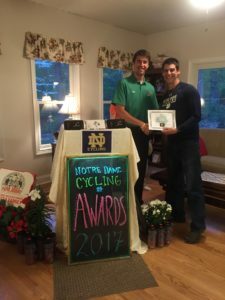 Please share this with your friends and family, as well as with anyone who loves Notre Dame or anyone who loves the great sport of cycling. I have been riding bikes for the last 5 years or so but started racing this year after James Pratt convinced me to help the team. One thing led to another and all of a sudden I was shaving my legs the night of my 21st birthday before the Michigan Criterium. Although I love the Sunday morning group rides, I have found that there is nothing quite like being in a sprint you know you shouldn’t be in but thinking you’re gonna win. Being from Southern California people may expect my to be a surfer dude that wears Lulu Lemon shorts. While I do own a pair of Lulu Lemon shorts, I don’t think I fit the California boy mold. Off the bike I try to read a lot. I love reading American classics as well as about American history. If you need a good book or have one, please let me know. Next year my goal is to work with sponsors to start building a team infrastructure that lends itself to team building. I also plan to spread the Green Machine Bible: Big Gear, No Fear. And remember, brakes are only for those who can afford them. 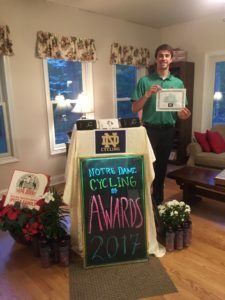 Born in the year 1997, I began development of my natural cycling talent through 11 years of baseball, 8 years of cross country, and eighth grade volleyball, then decided home was on the bike going fast, and sometimes even fast up hills. After my first year of racing last summer (2016) my development has been accelerated through motorpacing behind Tony Pratt and I now race as a competitive B (Cat 3/4), my top finish being tenth in a tough road race at Miami-Ohio. 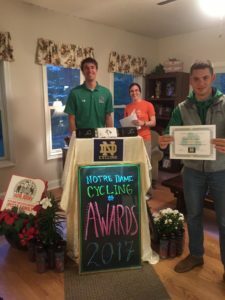 My greatest moment in cycling was a hard fought victory from a breakaway at Michigan’s Strade Bianche road race when my only competitor dropped his chain allowing me to solo to the victory, which I dedicated to my ancestral homeland Italy and residence hall, Keenan Hall. I have only resided in the state of Illinois, known for its endless mountain ranges. I am working this year with the other officers to push our club/team to the next level in terms of development and infrastructure. Growth of the team and its culture,as well as our A teams are my goals. Off the bike I am a passionate outdoors man, loving pretty much any activity in the wild. I also have been running the Twitter feed, which has been a good outlet for unused jokes and my vast (as some have described it) cycling knowledge. 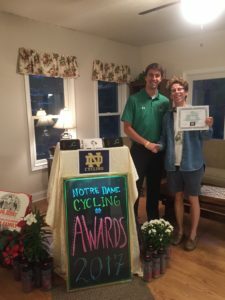 I am a Category 1 cyclist who has been riding/racing for 7 years. I started racing because my older brother was and it looked like fun. It has been so much fun, and, even though I’ve gotten stronger over the years, it’s never gotten easier. Racing is the best part of being a cyclist, but the training rides have an appeal of their own, offering a break from the intensity of racing and school. Most importantly, they help us prepare to ride harder at the next races. My goals before graduation are to podium at Nationals, win the individual overall in the MWCCC a second time, and to win a Collegiate race. Hello all! 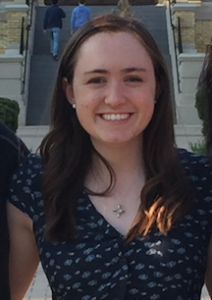 My name is Elizabeth Boyle and I am a rising sophomore at Notre Dame. I am originally from Salt Lake City, Utah but have grown up in Manhasset, New York. Coming from a family of avid cyclists, I have been called to the bike ever since a little girl. This year will be my first full year on the team and I am thrilled to be serving as secretary! 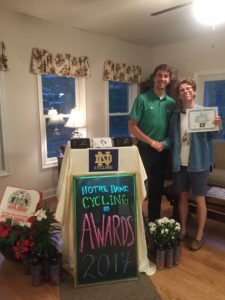 Outside of cycling I am a member of the Notre Dame Folk Choir, I serve as Vice-President of Breen-Phillips Hall, President of the Model UN club, and a member of Student Government. Being the ¼ of the officers who haven’t crashed, my goal is to keep up that statistic for the next year. 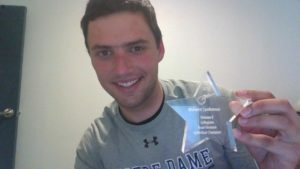 Go Irish!! After a tough few days of training in the hills around Nashville, the team moved north to Oxford, Ohio for the second week of MWCCC racing. Miami-Ohio’s course at Hueston Woods was a tough 8.6 mile loop featuring 3 signature climbs, the final two within a mile to the finish. The morning started with the team time trials and then moved into an afternoon of road racing. Highlights include a top-5 finish for the Men’s A TTT and a top-10 finish for newly upgraded B rider, John Caffarelli. 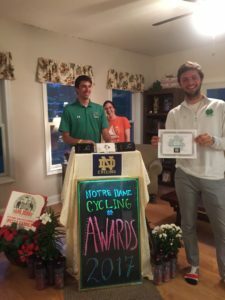 The 52 mile affair featuring David McKenna and freshly upgraded John Caffarelli started slow with Marian riders content to spin out the legs. At the foot of the first of 18 climbs, attacks flew off the front as various teams worked to establish the breakaway. The chaos continued for the next two laps until the 18-mile mark when a 5-man break escaped on the flats. The chase was on for those whose teams were not represented, but soon the pace dropped as the gap became insurmountable. Both McKenna and Caffarelli were content to stay in the field after a tough training camp in Nashville. A group of two pushed up the road mid-race making for 6 men up the road (one of the original 5 dropped back to the field). The sprint for 7th place started on the penultimate climb of the race with a soft attack that worked to wither the field. On the final climb, Case Western took to the front and didn’t look back. Caffarelli followed the move, making the selection for the final sprint. Caffarelli finished 10th, a great showing in his first B race. McKenna finished in 19th. The quartet of Tony Pratt, James Pratt, David McKenna, and John Caffarelli hit the road with a passion right from the start ramp and started to build rhythm and a sense of flow behind the diesel engine of Tony Pratt. Trouble came within the first two miles as McKenna found himself struggling to hold on after the first climb. The trio of Pratt, Pratt and Caffarelli continued to push on, but moments later James Pratt suffered a front flat. Wheels were swapped, but the race was effectively over, the boys deciding to cruise into the finish, saving energy for later in the afternoon. Thanks to a poorly marked corner and other misfortunes, the team still managed a 5th place finish. Look for great things from this quartet later in the season. The 68 mile road race with 3,000 feet of climbing was not suited for James and Tony Pratt, both on the very tall side for cycling (over 6’), however they managed well. ND was represented in the early split of the day, but the field came back together during the second lap. For the remainder of the lap attacks were constant, but futile as no group found enough space up the road. However, on the third lap, the pack lost focus and a select group of 9 riders escaped, the day’s breakaway was established. They gained time on the main field quickly, ending the race with almost a 10 minute lead. James and Tony missed the break, and preserved energy for the final sprint. Positioned well, James finished 2nd and Tony 3rd in the field sprint for the line (12th and 13th overall). A breakthrough day for James, as it was his first RR finish in the Men’s A field. Overall a great day for the A boys on this challenging and hilly course. 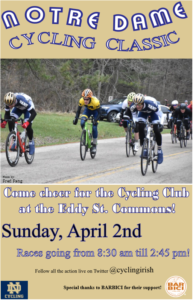 Louisville hosted the first race on the MWCCC and it proved to be the first real test for the Irish as they came off of an unexpectedly warm and pleasant winter for South Bend. 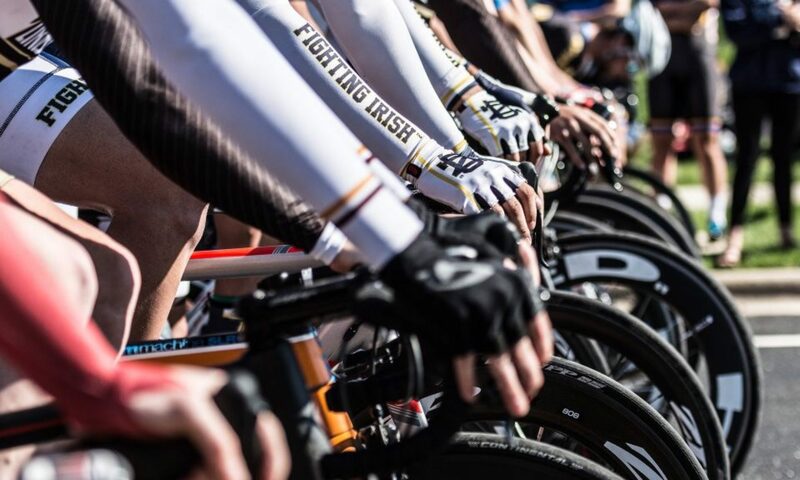 The weekend featured two distinctly different and challenging criteriums, Saturday’s at the hilly Long Run Park and Sunday’s at the flat and smooth Shawnee Park. Highlights from the weekend include two top-5 finishes, many successful first-ever races, and numerous points earned for the conference title. In addition the weather was not ideal with temps hovering in the 30’s and 40’s. Zach Llorens, Ron Mau, and Sam O’Melveny, started their racing careers with the Irish in the 30 min, 6-lap Men’s D race. All three were caught behind a crash early in the race, but managed to stay upright. Their chances to stay with the front group rode off into the distance as they picked their way through the wreckage. Sam O’Melveny (34th) had the best finish for the D squad after chasing back with a smaller group. Ron and Zach also found groups of their own as the field was splintered under pressure from the course. The three finished well and look to continue their development as racers. The cold temperatures did not let up for Theresa Smart, who represented Notre Dame in the Women’s Category C Race. With over a dozen competitors, Smart had her hands full with opponents and managing the rigors of a first bike race. The strong morning winds did not add any warmth to her situation, but Smart fought hard. After the field suffered from a solo attack, the leaders of the peloton made efforts to catch the solo escapist. Theresa finished in 8th place, a fantastic top-10 finish for the first time racer in a completely new environment. John Caffarelli, Anthony Hall, and Connor Williams raced in the Men’s C race and from the starting whistle animated what would be a slow cat and mouse affair. On the first climb of the day Caffarelli accelerated and found space up the road. Teammate Connor Williams made the bridge and the duo had a small gap over the sleeping field, that roared to life when they saw the men in blue and gold up the road. The group was together for the rest of the race as the occasional attack flew off the front. Caffarelli covered a Marian 1-2 punch and the race stayed together for the remainder of the race with UW-Madison, Purdue, and Notre Dame controlling the front. Things got dicey in the final as Caffarelli was pushed off the road, avoiding a potential wreck. Williams sat up after he saw his teammate out of contention and both rolled in a few seconds after the uphill field sprint. The C men were pleased with team tactics and strength during the race, but felt they had missed an opportunity in the final. David McKenna represented the Irish in the Men’s B race, a 45 minute affair around the loop at Long Run Park. 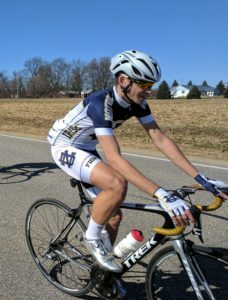 A solo move from a Marian rider featured for a majority of the race as the field, including large efforts from McKenna, worked to pull back the lone wolf. The escapee was eventually captured near the final of the race and on the final lap, McKenna attacked on the penultimate uphill punch prompting the moves to the line. The effort proved to be just too far away from the line as the field eventually caught back and McKenna rolled in for a 13th place finish. Sarah Cullen raced the 45 minute women’s A crit, a 11-woman field consisting of only two non-Marian or Lindenwood riders, Sarah and a Michigan rider. The pace was leisurely for the first half of the race, but attacks soon created gaps, and Cullen lost contact. She managed to chase back on. Two women were up the road on the final lap, and Cullen back in the group, who sprinted to a top-10 result in her first race of the season. Tony Pratt and James Pratt were looking to showcase their strength in the Men’s A race and Tony Pratt was first to flex his muscles when early attacks began to fly off the front. Both Pratt men spent time near the front of the group throughout the race, an affair with odd team tactics from powerhouses Marian, Lindenwood, and UW-Madison, who all wanted a field sprint, but attacked nevertheless. Tony Pratt was very well positioned in the final and rode to a top-5 finish amongst the heads of state in the conference. James rolled in mid-pack confident with the state of his fitness, despite the finish. Zach Llorens and Ron Mau raced the Men’s D race on the second day of the Cardinal Criterium in Louisville. Zach Llorens improved upon his finish from the day before as he found more comfort in the pack and held on to the main group before the pace started to ramp up with one lap to go. Ron Mau also had a strong showing, working with other dropped riders throughout the race to chase back on. The group never caught back onto the main field, but Ron enjoyed a small sprint to the line at the close of the race. The weekend was successful for all three first time D racers (Mau, Llorens, O’Melveny) as they look to continue their development throughout the season. The Men’s C squad found some redemption after a tough end to a strong opening race the day before with a top-5 finish, and 2 top-10s. The race started slow, with Connor Williams, John Caffarelli, and Anthony Hall content to follow wheels and “stay hidden” in the pack until the final. All stayed well positioned amidst the barrage of attacks and mid-race sprints as Purdue, Marian, and Lindenwood battled for prime points. The final prime came on the bell lap and all three followed the attacks into the finishing circuit. Caffarelli was well positioned at the front behind the UW-Madison leadout train when with 600 meters to go Williams attacked up the road, prompting the dash for the line. Caffarelli powered home to 4th, thanks to a well-timed leadout, with Williams finishing 8th, and Hall 10th. All three riders scored points for the team with their top performances and make-up for Saturday’s disappointment. David McKenna raced in the Men’s B race and was active in the field in sprinting for primes, chasing down the solo move, and setting up for a fast finish. Due to the fast course and strong field McKenna was unable to finish as he wanted, but certainly didn’t have a race to frown upon. His racing strategies and tactics will continue to develop especially as teammates from the C team upgrade to B riders throughout the course of the season. Sarah Cullen continued her success for a second day in the row, matching her best women’s A career finish. The race was fast and strung out as the small field, dominated again by Marian and Lindenwood, worked to secure points from primes. Cullen hung on throughout the proceedings as attacks flew almost every lap, sometimes with prime laps in succession of each other, and sprinted past a few riders in the finish for 8th place. She was content with the result and overall pleased with her first race weekend. The men of Pratt looked to continue early season success from the day before on a course that suited their flatland prowess. Attacks started early and Tony Pratt was quick to follow moves, and made the first move of the day, an eight-man group that found some space for just over a lap. The escapees were pulled back and while Tony recovered in the field for the next few laps, James Pratt spent time on the front pulling back the little moves as the day’s break attempted to be established. Mid-race, a 6-man move featuring the key teams in the race and key riders in the field created a significant gap . Tony Pratt made a stunning bridge before the group was out of sight, and once involved in the move, the gap grew and held between 20-30 seconds. Lindenwood’s team leader was left out of the move, creating havoc for the break’s chemistry as the Lindenwood rider involved was unwilling to work. The Lindenwood train eventually pulled back the move with 4 laps to go and the Pratt’s, as well as the top riders who had been in the break, took shelter in the back of the pack. With 2 laps to go, James was locked onto Tony’s wheel at the front of the pack, in perfect position to launch into the finish. 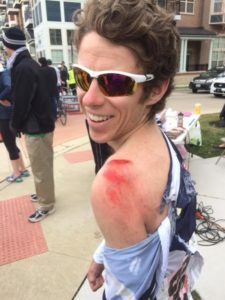 In the final corner before the bell lap, Tony Pratt was caught up in a crash between a Marian rider and his UW-Madison counterpart. James made it through and came around for the final time for a top 20 finish. Tony Pratt suffered a cut on his leg from a chainring, but otherwise is ready to race in Miami. Overall a successful first week to build upon as the season continues. 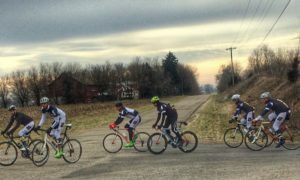 Race reports for Miami-Ohio RR to follow soon!